Clubs has something of an integrated social network: users have their own profile page with new items placed in it automatically, which other uses can comment on for encouragement. There's also a weekly leaderboard to foster some good-natured competition. The new Clubs feature is available for all languages, to all languages, users can comment on their friends' progress no matter who's using the app for what, and of course it works across Android and iOS apps. According to Duolingo's press release, the aim of all of this is to help people stay motivated as they make their way through the language courses. Okay. Okay. All that is great, Duolingo, really nice stuff. But don't forget: you promised us a Klingon language course on New Year's Eve. Pittsburgh, PA (December 29, 2016) Ready to meet your goals in 2017? Experts advise that teaming up ​ with friends is the way to go. Announcing Duolingo Language Clubs: now, friends and family members can create their own groups to keep each other on track with friendly nudging and competition. There’s nothing like peer motivation. Playing educational games collaboratively or competitively has been found to increase people’s drive to learn. 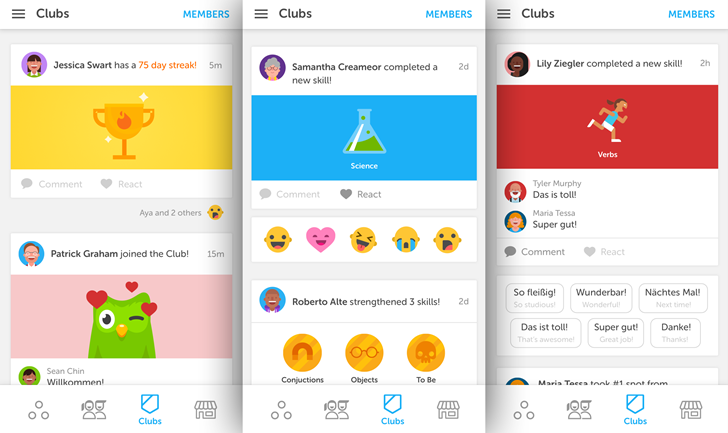 Duolingo Clubs — integrated within the Duolingo app — each have their own newsfeed and dynamic, weekly leaderboard. That way, it’s easy to get motivated by your friends’ progress (and go the extra mile to wrestle for 1st place!). Did you see that Jane in the German Club spent five minutes practicing today… before you even woke up? And darn, Mike earned points and passed Nick again. Those two have been neck and neck this whole week! Like gym buddies, but for your brain. As many gym-goers and dieters ​ already know, teaming up with like-minded friends can be the difference between giving up on day three and developing the physique of a Greek demigod. Learning a language is no different. Clubs helps language learners stay on track by praising each other for exceptional performance with comments and reactions (Jane has a 100-day streak? Wunderbar!) and nudging those who could use more practice (Nick is now last on the leaderboard? ¡Eso no está bien!). The best way to keep a New Year’s Resolution. ​More people googled “learn language” than “get fit” around New Year’s Eve last year, and this new feature is here to help you meet your goals. No excuses for giving up by February — not when you and your friends are in it together! While you’re at it, now might be a good time to start planning that group vacation to Barcelona (#squadgoals). “Learning a language is an inherently social experience,” said Luis von Ahn, CEO and co-founder of Duolingo. “One of the hardest things about learning a language is staying motivated, and we believe this new feature will draw friends and family together around a common goal to help our users hit their goals more quickly.” Clubs is available in the latest versions of the Duolingo iOS app and Duolingo Android app for speakers of English, Spanish, Portuguese, French, German, Italian, Russian, Dutch, Hungarian, Ukrainian, Turkish, Korean, Chinese, Japanese, Vietnamese, Indonesian, Greek, Romanian, Czech, Polish, Thai and Hindi. Get the updated version of Duolingo and start “clubbing.” It’s 100% free as always!